Food Costs > How Much Does Ginger Cost? Ginger is a widely used spice for food, medicine and even tea. This flowering plant grows about three feet tall and has tall narrow green leaves with yellow flowers. Originating in the tropical rainforest of Southern Asia, ginger no longer grows in the wild. Ginger is usually sold in bulk, and the price will depend on the amount of ginger purchased and where you’re purchasing it from. 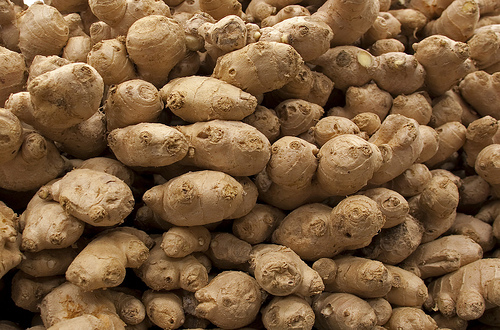 On average, fresh root ginger can cost anywhere from $3 to $15 per pound. Smaller ginger seasonings can cost about $1.50 to $3 per ounce. Ginger has several uses that make it a unique addition to any dish. It is spicy and stimulating to the palate but can taste sweet at the same time. Ginger is often pickled in vinegar, added to baked goods or cooked as a raw ingredient. If it is boiled, it can create something known as a ginger tisane, which honey is often added to. It can also be made into a candy or wine. Ginger is known to have many anti-inflammatory and antioxidant compounds such as caffeic acid, curcumin, salicylate and capsaicin. 100 grams of ginger has 17 grams of carbs, 2 grams of dietary fiber, 1.82 grams of protein, 1.7 grams of sugar and 13 mg of sodium. Fresh ginger can be purchased at local farmers’ markets, online via Amazon or at most local grocery store produce departments. It should be available year round. Ginger serves several purposes and is considered a very versatile type of spice. Ginger is often used in oriental cuisines adding that much-needed spice and stimulation to the food. Medical News Today says ginger is known to decrease the risk of obesity, heart disease and diabetes. It can also help with digestive issues, nausea, pain reduction and inflammation. For maximum freshness, store ginger in a cool and dry place. If refrigerated, it can last up to two weeks; however, if frozen, it can last up to three months. The best way to store fresh ginger, according to thekitchn.com, is either by storing it in the refrigerator wrapped in a paper towel or soaking it in a bottle of sherry. Another method is simply by storing a whole, unpeeled ginger root in a resealable plastic bag with all of the air pushed out. When choosing ginger in person, look for a mature root with smoother skin. Melissas.com recommends avoiding wrinkled skin as it may indicate the root is dry and will be older. A good root will have a fresh fragrance and will be spicy to the taste. Fresh ginger can be substituted for ground ginger at a ratio of six to one. Ginger does have a long shelf life as long as you store it at room temperature. However, do not buy too much ginger at one time if you only use it sparingly. Buy just the appropriate amount of ginger that you need to make sure that it does not spoil.